It was a negotiation from the start. 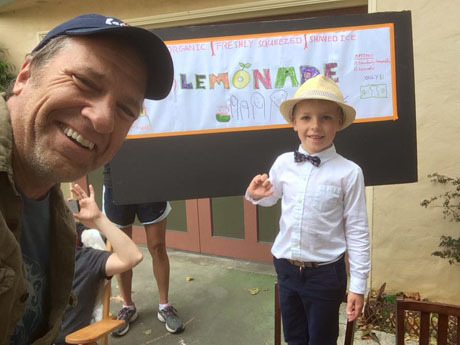 Alexander wanted to sell me a cup of fresh-squeezed lemonade for $1. I wanted to pay 50 cents. So we haggled. I argued the key ingredient – water – was free. Alexander reminded me there was a drought in California. I pointed out that a glass of cool lemonade served on a chilly, overcast day like today, was less valuable than it might be on a day that was hot and sunny. Alexander pointed out the the importance of staying hydrated in all temperatures. I said a glass of lemonade served just around the corner could be purchased for the same $1, but included unlimited refills. He went on to discuss the cost of cups, marketing, signage, and of course, payroll. He then suggested my purchase would help support a small business, and that my patronage would forge a relationship with the owner and sole proprietor of a nascent but growing concern. In the end, we settled on $2, which included the lemonade, a strawberry, and permission to post this photo. ‘Hard Work’ Shouldn’t be a Conservative vs. Liberal Issue. But it is.